Are you looking to announce, release, promote or launch your Website, Products, Services, Events, Book, Music, Crowd Funding campaigns, Apps, etc? Then look no further! We’ll write and distribute a well-researched press release using standard guidelines and distribute the PR to high authority sites with contextual backlinks that boost your website ranking on Google as well. Bulk writing & distribution (Premium Package). You’ll get a copy of press release before distribution for your review. Two anchor text links & 1 image allowed inside the release on all possible sites. Live placement links will be provided upon completion. Basic ($5): We’ll write a compelling press release up to 300 words and distribute to 25 authority sites with contextual backlinks. Standard ($10): We’ll write a well-researched SEO press release up to 500 words and distribute to 50 authority sites with anchor text backlinks. 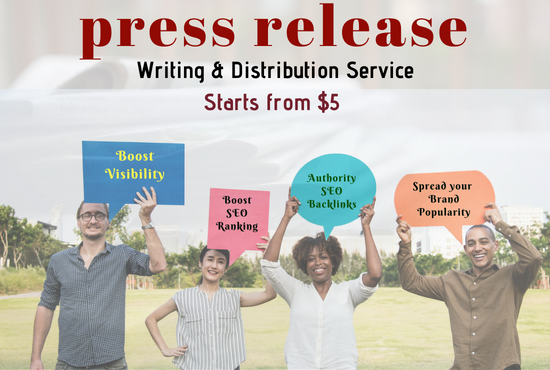 Premium ($45): 5 Press Release Writing + Distribution to 250 high authority sites with contextual backlinks. Have Questions? Please drop us a message. Write An SEO Press Release, Distribute To 50 Sites With Contextual Backlinks is ranked 5 out of 5. Based on 21 user reviews.